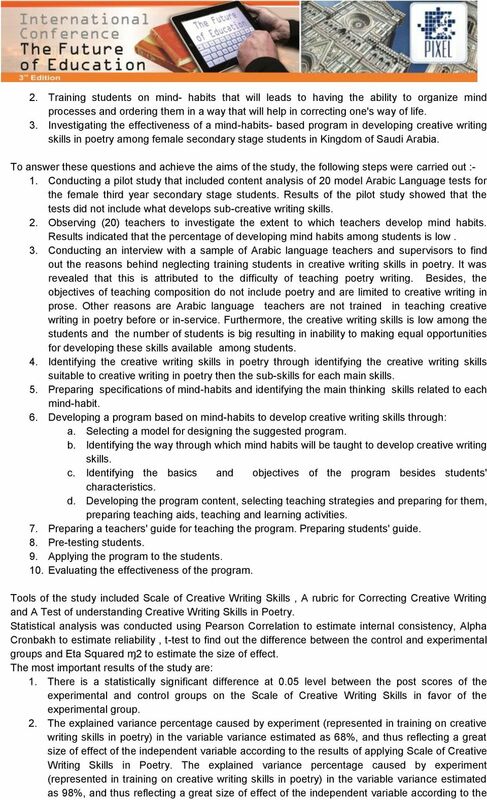 Download "Effectiveness of Program Based on Mind Habits in Developing Creative Writing Skills in Poetry Field for High School Female Students in Saudi Arabia"
2 of writing. Writing also functions as a tool for the development and promotion of thinking skills (10). Mcfarland's study (11) pinpointed the importance of training programs on creative writing in poetry. Recently, psychologists also cared for everything that develops creative skills including experimenting methods of teaching creative skills. These methods included different ways training on which leads to development in performance. Thus, Cognitive researchers started to care for educational strategies that puts students in open environments in order to enable them to make use of the thinking strategies in their daily life. They were also interested in raising their awareness of their works and that thinking should not lag behind work. This necessitated the emergence of active habits of mind (12) which include persistence, controlling impetuousness, listening comprehensively and empathetically, thinking flexibly, metacognitive thinking, striving for accuracy, questioning and problem solving, applying previous information to new situations, clear thinking, data collection using all senses, perception and creativity, responding surprisingly and awesomely, responsible risk-taking, humur, reciprocal thinking, and constant readiness to continuous learning (13) and (14). Since information economy requires training on problem solving styles, creativity, analysis, working as a group or an organization and drawing research policy, this led to starting in paying interest to habits of mind. This is because their applications depend on creativity, learning for life, and working in teams (15). Costa and Kallick (16) believe that training on habits of mind will aid learners in solving problems in life, taking rational and right decisions, managing business and facing challenges. Wineburg's study (71) ascertained that although habits of mind differ, their learning and using them make them stable and repetitive. Therefore, learning outcomes and educational invariants should be focused on. They should be changed to a repetitive behavior and a constant method a the learner's life. Results of developing countries' experiments showed that they were concerned with developing habits of mind and their applications, for the development of teaching and learning, while solving problems, practicing creative thinking and decision making. Besides, the British National Curriculum (18) adopted them. Some educational projects were also concerned with habits of mind considering them as a basis for educational development. Some of these projects are Scientific Literacy Project or Science Teaching foe All Americans till 2061 under the auspices of the American Association for the Advancement of Science (AAAS), Based on the aforementioned the problem of the study is identified in investigating the effectiveness of a mind-habits- based program in developing creative writing skills in poetry among female secondary stage students in Kingdom of Saudi Arabia. 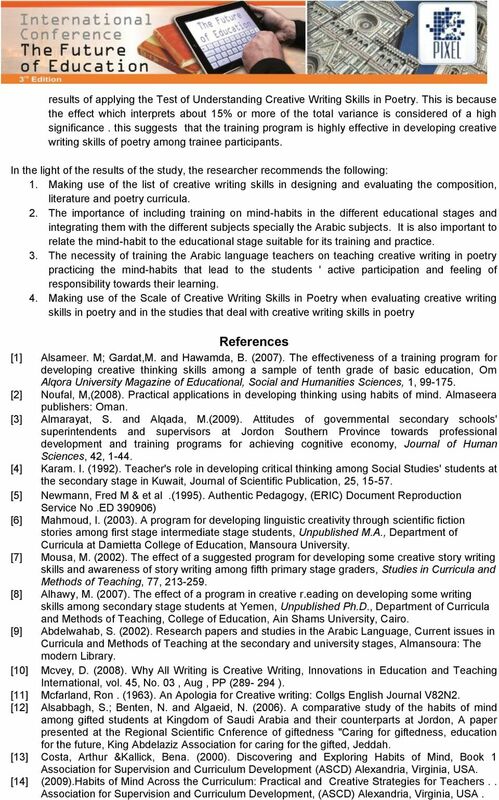 Thus, the study aimed at answering the following main question: What is the effectiveness of a mind-habits- based program in developing creative writing skills in poetry among female secondary stage students in Kingdom of Saudi Arabia? This main question can be divided into the following sub-questions: 1. What are the creative writing skills suitable for female secondary stage students in poetry? 2. What are the specifications of mind-habits that should be developed in female secondary stage students? 3. What is the effectiveness of a mind-habits- based program in developing creative writing skills in poetry among female secondary stage students in Kingdom of Saudi Arabia In the light of what is mentioned earlier, this study aimed at developing the teaching and learning processes through :- 1. Relating language to thinking through identifying the creative writing skills suitable to the female students at the secondary stage. 4 results of applying the Test of Understanding Creative Writing Skills in Poetry. This is because the effect which interprets about 15% or more of the total variance is considered of a high significance. this suggests that the training program is highly effective in developing creative writing skills of poetry among trainee participants. In the light of the results of the study, the researcher recommends the following: 1. Making use of the list of creative writing skills in designing and evaluating the composition, literature and poetry curricula. 2. The importance of including training on mind-habits in the different educational stages and integrating them with the different subjects specially the Arabic subjects. It is also important to relate the mind-habit to the educational stage suitable for its training and practice. 3. The necessity of training the Arabic language teachers on teaching creative writing in poetry practicing the mind-habits that lead to the students ' active participation and feeling of responsibility towards their learning. 4. Making use of the Scale of Creative Writing Skills in Poetry when evaluating creative writing skills in poetry and in the studies that deal with creative writing skills in poetry References  Alsameer. M; Gardat,M. and Hawamda, B. (2007). The effectiveness of a training program for developing creative thinking skills among a sample of tenth grade of basic education, Om Alqora University Magazine of Educational, Social and Humanities Sciences, 1,  Noufal, M,(2008). Practical applications in developing thinking using habits of mind. Almaseera publishers: Oman. Almarayat, S. and Alqada, M.(2009). Attitudes of governmental secondary schools' superintendents and supervisors at Jordon Southern Province towards professional development and training programs for achieving cognitive economy, Journal of Human Sciences, 42,  Karam. I. (1992). Teacher's role in developing critical thinking among Social Studies' students at the secondary stage in Kuwait, Journal of Scientific Publication, 25,  Newmann, Fred M & et al.(1995). Authentic Pedagogy, (ERIC) Document Reproduction Service No.ED )  Mahmoud, I. (2003). A program for developing linguistic creativity through scientific fiction stories among first stage intermediate stage students, Unpublished M.A., Department of Curricula at Damietta College of Education, Mansoura University. Mousa, M. (2002). The effect of a suggested program for developing some creative story writing skills and awareness of story writing among fifth primary stage graders, Studies in Curricula and Methods of Teaching, 77,  Alhawy, M. (2007). The effect of a program in creative r.eading on developing some writing skills among secondary stage students at Yemen, Unpublished Ph.D., Department of Curricula and Methods of Teaching, College of Education, Ain Shams University, Cairo. Abdelwahab, S. (2002). Research papers and studies in the Arabic Language, Current issues in Curricula and Methods of Teaching at the secondary and university stages, Almansoura: The modern Library. Mcvey, D. (2008). Why All Writing is Creative Writing, Innovations in Education and Teaching International, vol. 45, No. 03, Aug, PP ( ). Mcfarland, Ron. (1963). An Apologia for Creative writing: Collgs English Journal V82N2. Alsabbagh, S.; Benten, N. and Algaeid, N. (2006). A comparative study of the habits of mind among gifted students at Kingdom of Saudi Arabia and their counterparts at Jordon, A paper presented at the Regional Scientific Cnference of giftedness "Caring for giftedness, education for the future, King Abdelaziz Association for caring for the gifted, Jeddah. Costa, Arthur &Kallick, Bena. (2000). Discovering and Exploring Habits of Mind, Book 1 Association for Supervision and Curriculum Development (ASCD) Alexandria, Virginia, USA. (2009).Habits of Mind Across the Curriculum: Practical and Creative Strategies for Teachers.. Association for Supervision and Curriculum Development, (ASCD) Alexandria, Virginia, USA. 5  Campbell, J. (2006).Theorising Habits of Mind as a Framework for Learning, Proceedings of the Australian Association for Research in Education Conference, Adelaide, South Australia. Costa, Arthur &Kallick, Bena (2005). Habits of Mind A Curriculum for Community High School of Vermont Students. Wineburg, Sam. (2003).Teaching the Mind Good Habits. The Chronicle of Higher Education v49i31b  National Curriculum. (2005). Developments in Science in Teaching, London: Open Books. Researcher s Name: Chau Van Don, Vice Head of Scientific Management and International Cooperation Office, Phu Yen University, Vietnam. MASTER OF ARTS IN EDUCATION (M.A. in Ed.) Eighteen credit hours of undergraduate work in professional education and Educational Psychology are required before admission to the graduate program in Education. NORTHERN VIRGINIA COMMUNITY COLLEGE PSYCHOLOGY 211 - RESEARCH METHODOLOGY FOR THE BEHAVIORAL SCIENCES Dr. Rosalyn M.
The Online Journal of New Horizons in Education Volume 3, Issue 2. reflective teaching, student teachers, teaching skills, primary science teachers.